A complex set of factors have long impeded the development, deployment, and affordability of critical medical treatments in low- and middle-income countries in Africa and around the world. According to the authors of a new report from Brookings’s Center for Technology Innovation, incentivizing private investors and pharmaceutical companies to raise their investment in health care R&D is critical to addressing this global challenge. To determine which countries have the greatest health governance capacity, or best environments for investment, researchers Darrell West, John Villasenor, and Jake Schneider analyzed data on 25 indicators in five relevant categories: Leadership and Management Capacity, Policies, Regulations, Infrastructure and Financing, and Health Systems. Each category was associated with a maximum score of 20, corresponding to a maximum aggregate score across all categories of 100. The researchers examined 18 countries, including 11 in sub-Saharan Africa: The Democratic Republic of Congo, Ethiopia, Ghana, Kenya, Liberia, Mozambique, Nigeria, Sierra Leone, South Africa, Tanzania, and Uganda. South Africa received the second-highest score of all 18 examined nations, with 81 out of 100 possible points. Ghana also performed especially well among African nations and ranked fourth overall. The nation received its highest score (18/20) in the “Leadership and Management Capacity” category, driven by particularly high marks on the indicators related to the Worldwide Governance Indicators Political Stability Index and Transparency International’s Corruption Perceptions Index. Mozambique rounded out the top-five performing countries on the Index, with an overall score of 72 points. Another noteworthy highlight among the authors’ findings is the fact that Liberia and Sierra Leone scored quite high on the “Leadership and Management Capacity” dimension. These scores (18 and 17 points, respectively), were largely driven by the fact that aid, foreign investment, and external resources make up a relatively high percentage of total health expenditures in these nations. As West, Villasenor, and Schneider note, because of the recent Ebola crisis, both countries saw an inflow of external resources and this helped them upgrade their management capacity to fight this epidemic. Some of the other sub-Saharan African nations on the index have considerable room for improvement. 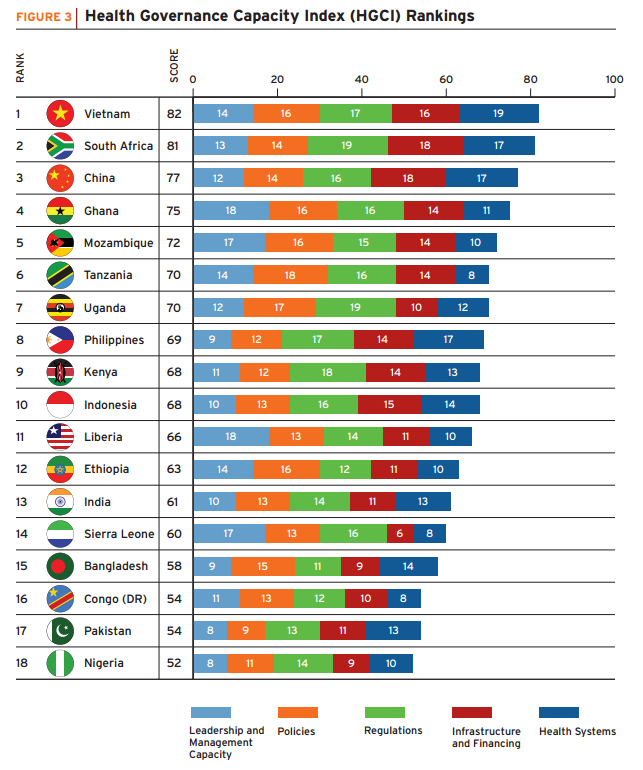 The Democratic Republic of Congo and Nigeria both ranked among the bottom three countries, with 54 and 52 points out of 100 (respectively). “A defining challenge for these countries is a weak performance on ‘Leadership and Management Capacity’ as well as ‘Health Systems,’” write the report authors, suggesting that targeted efforts to improve those areas could have a significant impact on their ability to absorb new investments relevant to their global health goals. More generally, the researchers recommend that low- and middle-income countries increase government transparency and stability, lower tariffs on medical products, expedite the regulatory process for new drugs, invest in health infrastructure, and increase (to the extent possible) government spending on health care in an efficient and targeted manner in order to attract greater private investment in health research and development. An interactive scorecard on the Brookings website details each country’s performance on the Health Governance Capacity Index. The report summarized here, “Health governance capacity: Enhancing private sector investment in global health,” is just the first of six planned publications by the Brookings Private Sector Global Health R&D Project. Visit the project page for updates on future publications, their findings, and implications for African economies.